You are currently browsing the MOVEMENT CoLab, LLC ® blog archives for . Neck pain can be an uncomfortable experience, and is extremely prevalent due to activities of daily living that cause our heads and shoulders to round forward. Outlined below are four simple stretches to provide relief, that can be done in under 10 minutes! Sit up tall in a chair, and touch your fingertips to your shoulders. While looking straight ahead, tilt your head to the left. You may use your left hand to gently pull your head down. Next, tilt your head so that you are looking down toward your left shoulder. 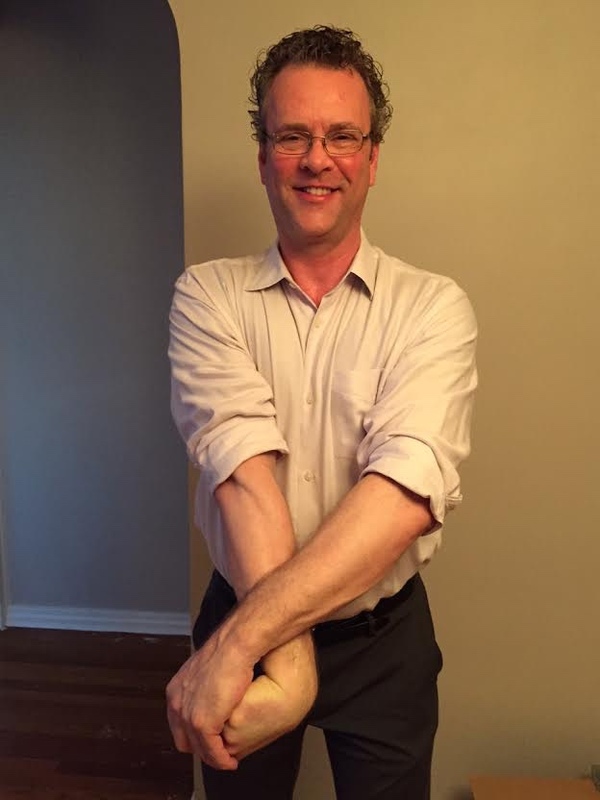 Last, place the palm of your right hand behind your neck, keeping shoulder blades down. Hold for 5-10 breaths, then repeat on the opposite side. Lie on your stomach, on a mat or carpet with your hands stacked beneath your forehead, legs straight behind you. Keep your abdomen engaged to protect your lower back. Lie on your stomach, on a mat or carpet with a rolled-up towel beneath your forehead. Be sure to keep your nose pointing toward the floor. Extend your arms out in front of you, into a Y-shape. Keeping your head down, inhale to lift your arms, hold for a beat, then lower your arms back down. Keep your chest and neck relaxed. Performing this series of stretches once a day will help to relieve tension, correct musculoskeletal imbalances, and restore flexibility. Happy stretching! Model: Emilia Iorillo, PMA®-CPT and MOVEMENT CoLab assistant. How much do you use your hands? Do writing, typing, working, or DIY projects lead to pain and stiffness in your hands? If so, this week’s Tuesday Tip is for you! These stretches can be done in any order and will help you release the built up tension you have in your hands and forearms. Try to do them as soon as you feel tension building up, or are experiencing pain below the elbow. Repeat as many times as necessary. 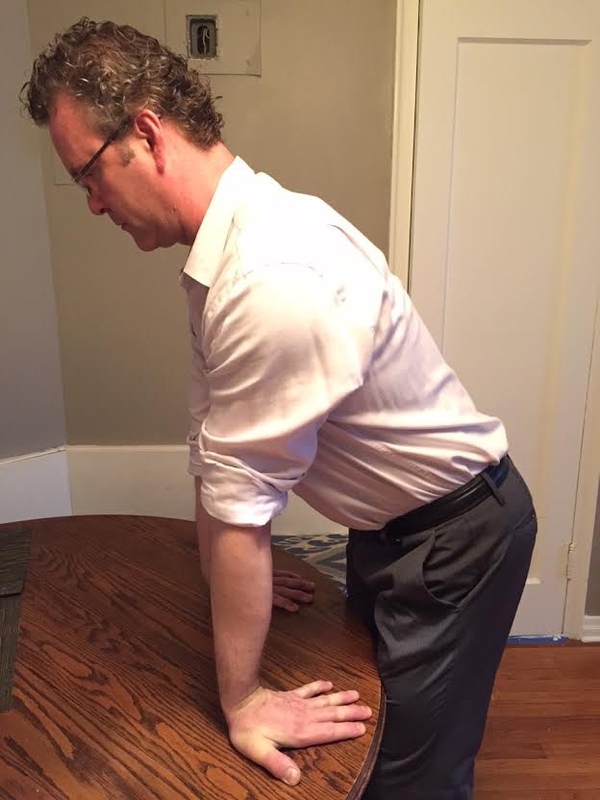 Stand at your desk with your fingers pointing back toward your thighs. Keeping the heels of the hands firmly planted on your desk and your elbows straight, lean your body back toward the fingertips. You will feel a stretch in the fingers, palms and up the forearms to the elbows. Hold for 10 slow breaths. Straighten your arm and make a fist. 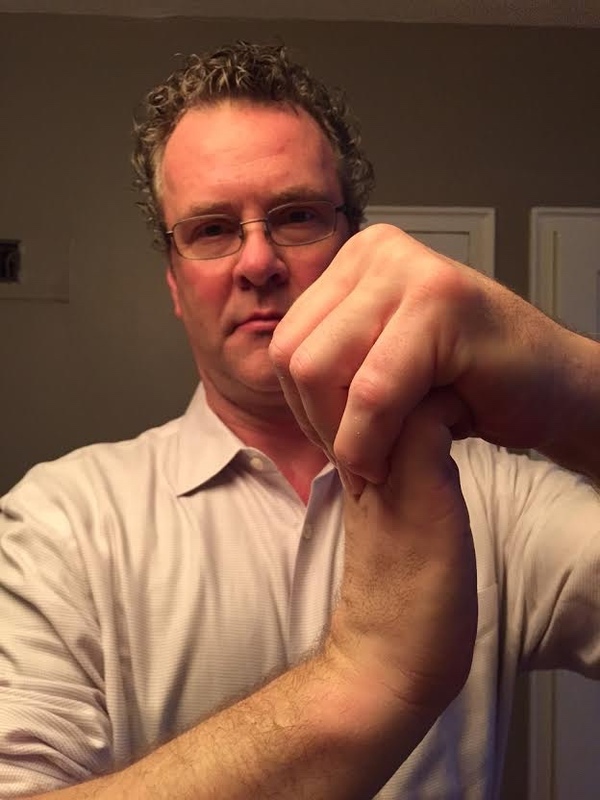 Turn your fist away from your body as if your arm is shaped like a golf club. Reach over the top with the opposite hand and gently pull your fist toward your elbow (keep your fingers curled). 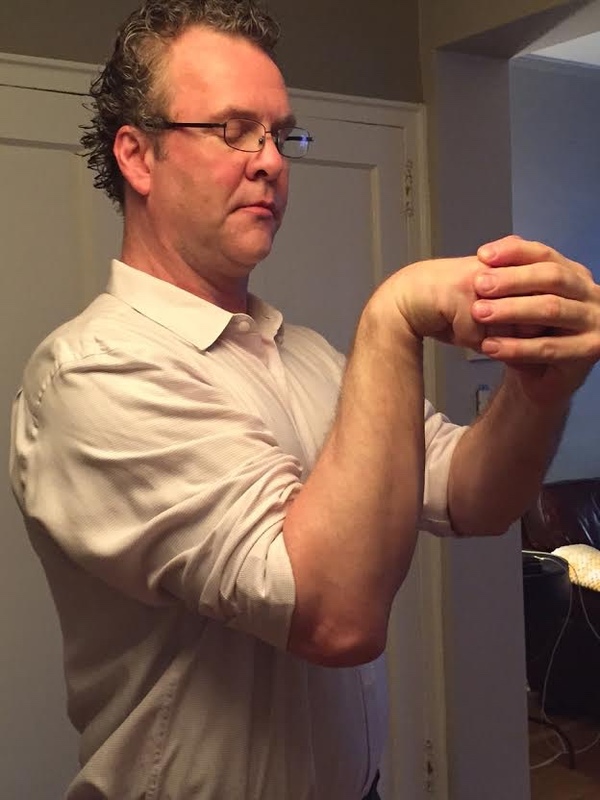 You will feel a stretch in the top of the wrist and up the forearm. Hold for 10 slow breaths. Bend your elbow and make a fist. Reach over the top of the fist and pull it down toward your elbow. Rotate your fist as if you are looking through a periscope to find where you feel the most stretch and hold for 10 slow breaths. Bend your finger pads toward your palm. Reach over the top and squeeze the pads toward the palm as you bend your closest knuckles back toward the top of your hand. Hold for 10 slow breaths and repeat on the other side. Incorporating these simple, quick stretches will give you the dexterity your hands need to help you get your jobs done! ALWAYS keep yourself in the seat of the student! Look up to masters, elders and colleagues for mentorship. Look to learn from your own students, clients and patients, regardless of your years of expertise in your field. How can another field inform your practice of Rehabilitation, Pilates, Choreography and Teaching? 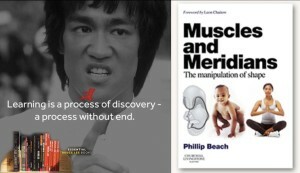 Kim is now diving into the writings of the legendary Bruce Lee while Bob continues to hone his clinical practice by studying the work of Phillip Beach. Who can you look to for a new light to brighten your work? Let’s hear about your process of lifelong learning and share with one another. Turn Your Biscuits To Bananas! Fancy Feet aren’t just for Dancers! Articulate feet for runners, basketball players, yogis, surfers, nurses and people of all walks of life help the body absorb and transmit force. Do your feet ache after long days at work or after performing your favorite movement activity? Do you ever feel like traditional treatment options for foot/ankle pain have failed you or only resolve pain in the short term? 1. Lace your fingers between your toes so that the webbing of your fingers meets the webbing of your toes. Once laced, make small infinity signs or circles with your hand to stretch the space between the metatarsals and stretch the toes. Perform for 1 minute on each foot. 2. Use a soft tennis ball and SLOWLY roll the sole of the foot from the heel to the toe tips. When you reach the arch of the foot, pause, and use your hands to mold your foot to drape passively over the ball. This stretches the tissues on the dorsal (top) aspect of the foot and increases the space between the bones in the midfoot. 3. Repeat step #2 with a wooden roller or a slightly harder prop to increase the depth of the release to the plantar tissues and mobilize the bones of the foot. 4. Stretch the ankle by padding the floor and sitting back towards your heel. Hold the stretch for at least 1 minute. Stretch one foot at a time for best results. “I try to perform the feet exercises Kim taught me before and after every dance class I take as a warm up and cool down. I started to see my feet improving after only one day of this regimen! #biscutbegone.” – Genna Mattana. Couples That Train Together Remain Together!